The Node Graph node reads a PixaFlux project and executes it a given number of times. The Node Graph node is used in Visual Scripting with PixaFlux. Drag the Node Graph icon into the Node Graph. 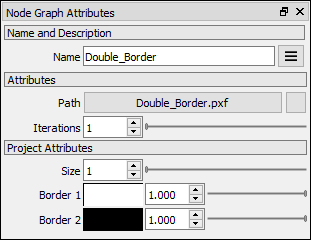 In the Node Graph Attributes panel click the Path attribute to load a PixaFlux project. Double-Click the Node Graph node to reactivate it and display the inputs, outputs and attributes of the project. When the Node Graph loads a project it finds all IO nodes with connections to their outputs and sets them as its inputs. Any nodes connected to the input of these nodes will be ignored by the Node Graph node. The name of the input socket is set to the name of the IO node or the name of the input type if the name is not defined. When the Node Graph node loads a project it finds all the IO nodes that have no output connections and sets them as its outputs. The name of the output socket is set to the name of the IO node or the name of the output type if the name is not defined. The path of the project that this Node Graph node executes. The number of times the project is executed. When the Node Graph node loads a project it finds all the Attributes nodes in the pxf file and displays their attributes in the attributes panel. Attribute nodes named private are ignored by the Node Graph node. The Node Graph node can execute the loaded project in a loop for a defined number of times. In order to support values that are updated on each loop iteration, the Node Graph node pairs input and output IO nodes, and according to the IO node Loop Action attribute it can reapply the project to the updated value.